In this alternate dimension in the world of Clannad, Fujibayashi supporters will be glad to hear that their goddesses are now the main spotlight of the story. The other female characters, such as Nagisa, Tomoyo, et cetera, still exist in the story, however their lives no longer cross with Tomoya’s the way they did from the TV series (say good bye to Ushio). Fans wishing for a new OP or at least a change in scenes/characters for the OP will be disappointed. Not only does it reuse the same OP from After Story, but all soundtracks and BGM throughout the OVA are nothing new. Everything just recycled from both the first and second season of Clannad. But is that necessary a bad thing? Probably not. For instance, the insert song from the first season, Ana, is a much more fitting ED than the original After Story ED (TORCH), which many find to be too upbeat for a show like Clannad. Assuming you have been following Clannad and After Story, the animation should not be anything new to you. There is still the shadow from trees and clouds cast down onto our characters. There is still the smooth dynamic animation transition between scenes. And there is still the unique camera angles giving viewers a different perspective every now and then. In addition, I was totally impressed by the personification used in this short episode. 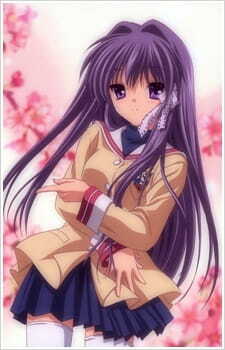 The clouds that were used to express the inner thoughts of Kyou (her logic and desire) were exceptionally well made. Perhaps the one thing that fans can enjoy now is the more elaborate character developments for the Fujibayashi twins. Although their feelings for Tomoya were evident ever since the beginning of the first TV series, but for various reasons they were held back and ultimately became sidelined characters. I have always regarded this triangular relationship the hardest and most interesting of all Clannad routes. No matter which girl Tomoya chooses, the pair still has to face the other for the rest of their lives. Both sisters wanting to love and be loved but they are bound to hurt each other in the process. Viewers see the characters grow and mature, making decisions that will affect themselves, their family, and their future. Ever since the end of the original CLANNAD, fans of Kyou have wished to have her story arc properly animated, only to have Tomoyo's arc animated first instead. But now at the end of the highly successful sequel CLANNAD ~After Story~,the latest DVD release of After Story included an extra episode called CLANNAD ~Another World~ Kyou Chapter. This is the long awaited adaptation that the Kyou fans (me included) have wished for for a long time. Was the long wait for this worth it? read on to find out. + Finally we get a decent adaptation of Kyou's story arc from the original Visual Novel. + A lot of the elements of what made the original story so great are shown, somewhat modified but they are still there. - There was just not enough time to animate ALL the key parts in a single 23 minute episode. - The story progresses at lightning speed and it affects any type of emotional effect they are trying to pull. - A lot of the reasons behind the character's actions are not explained, lessening any type of impact that they might have. Again this is due to the lack of time allowed in the episode. + The same art CLANNAD has always used, which is of course nothing short of beautiful. + The songs helped greatly at intensifying some scenes. + The seiyuus IMO did a fantastic job on their roles...making some scenes sound even better than in the original versions (The VN had the same voices as the anime). + Kyou (and you could say Ryou) finally get the development they deserved. - Unfortunately due to the time limit, some of the development felt rushed and not very believable. - A lot of Tomoya's inner thoughts and struggles are not explored, making him look like some kind of random confused kid in a love triangle. - Kyou's depression meter is cranked up way high, it just feels weird at first. Enjoyment: I can't lie...after waiting so long for this I kinda had my expectations a little high and I was a little let down by this. However this does not mean that the OVA was bad....this was a really good and solid episode. However, it was way too overkill to try and fit so much content into such little time. In the end I was still satisfied by this OVA, and it was great seeing Kyou finally getting her chance in the spotlight. Overall, there is absolutely no excuse for any fan of this series to not watch this. If you loved the original anime and if you are a fan of Kyou, then I am not recommending you to watch it...I AM COMMANDING YOU to watch this (and also check out Tomoyo's chapter as well). Even though this could have been way better if it had lasted longer, this is still a great episode and a must watch for all Clannad fans. Go do it...go now! Much like last year's Tomoyo Chapter, KyoAni has gone back once more to animate the main arc of another popular girl from the visual novel Clannad, this time focusing on Kyou Fujibayashi. The Kyou Chapter is a good piece of storywork, with a solid and steady narrative flow, exceptional artwork, great BGM and performances, and decent, though generic, characterization. For now, I'd like to focus on the facts before getting to my opinion, so as to differentiate, I didn't think this was a bad little story per se, but raging Kyou fans might just be better ignoring the existence of my review when I get to my enjoyment, as there's no chance I'll be sugarcoating matters. Kyou Chapter, first off, accomplishes an astounding feat by compressing several hours worth of material into a half-hour short story, which can be no easy task whatsoever. Masterful composition of key scenes never feel out of place nor does it feel as if the story is taking any large leaps from event to event, skipping other priorities. Though it could easily have been expanded on, the basic plot is well-contained and the delivery is pitch-perfect. Nothing phenomenal, no massive twists or unexpected incidents given what we know of Kyou and Ryou from the series that could put it over, but a job well done. Despite the brevity of Kyou Chapter, KyoAni also does some wonderful short pivotal points with each character, expressing different things about them through the animation whether than words, the imagery of which is profoundly captivating. A particular scene involving a farewell kiss was so expertly crafted I could not contain my appreciation for it. It spoke leagues about the girl in the scene even though she said nothing. Though this short story often relies on the viewer to have prior knowledge of the characters, it does a good job of filling viewers in through rather subdued methods. In the technical realm, KyoAni shines just as brightly as they did with the series itself. Gorgeous fluid animation, exquisite backgrounds, great facial expression from the characters, it's tops across the board for the animation powerhouse. Sound carries the wonderful OST back with no piece of it used in an inappropriate or unnecessary way, always adding an extra something to the mix. Performances are also dead-on. Though I already expressed about the visual aspect of the characterization, the audio aspect is certainly nothing to knock. Everyone is voiced sincerely as the characters they have been playing, just in new situations, and seeing the twins' seiyuu finally shine is definitely a reason to check this out as well. Despite the well-earned love I've given this review such far, I greatly disliked it. Though well-plotted, I thought it was generic. Though there was great characterization, I freakin' loathe the girl I'm supposed to be rooting for. Though the art and sound are great... okay I agree with that. The fact of the matter is I personally cannot stand the character that misses his or her chance, only to whine about it when someone else takes the chance themselves. Moreso, I hate it when said whiner wins because I'm supposed to feel sorry for her not being able to express her feelings. Hell, this OVA actually had the opposite reaction on me. It made me dislike Kyou more and make me like Ryou more. How could I not when she displays her courage despite her timid demeanor and does her best to make Tomoya happy WHILE KYOU JUST CRIES. Even though this OVA was meant to pander, I didn't for one moment expect it to insult me to this degree. While others may, and probably will, enjoy this, no dice from me. Overall, I give Clannad: Another World, Kyou Chapter a 7 out of 10. As one concludes Clannad: After Story, they are presented with another "alternate world" OVA (such as the one that ended the first season of the original Clannad anime) in the form of a chapter focused around Kyou Fujibayashi (as well as in turn: Ryou, her younger twin sister). The episode takes place time-wise around the end of the first season of the show (though not given an "exact" episode parallel like the last one with Tomoyo). However, it strangely works better to watch it at the end of the second season and I don't think it would have the same impact if watched in tandem with the first season's end. Any fan of the show who has watched up until this final OVA episode knows that both Fujibayashi twins struggled with affections towards the main protagonist Tomoya Okazaki since episode 1, and as we find out later, even before that (due to the prequel episode given to us late in After Story). However, as sadly expected, Tomoya is destined for his rightful love for Nagisa. This OVA gives us a lovely taste of "what could have been" and further enhances the entire Clannad experience and story. We see that Kyou, despite her rough exterior, is actually a very sensitive girl who is afraid to get emotionally hurt and has a very sacrificial outlook towards those she loves and cares for deeply. You heavily sympathize with her character's loss more in the normal story due to this chapter. On the flipside, Ryou is shown to be that, though she is the shyest girl out of the main cast, once she begins to date Tomoya, she becomes clingy, desperate, and willing to change herself to keep him "hers". She faintly shows a fiercer side of having a more bold and "aggressive" nature buried deep down below her frail appearance. Again, this causes a power struggle of emotions for the watcher, as they are torn between two quality girls and their love for Okazaki. I personally was "tossed in the storm" (just as I was in the first season of the main show when Tomoya shows who his heart truly lies with and the emotional aftermath is spilled out on the others). Argh, it's really annoying, as my loyalties lie with almost all of them (the girls). If anyone was longing for and missing a love triangle in Clannad, here you are (as we already also were given a brief and faint "harem" in the main plot of season 1). By the end of this OVA, we see that Tomoya and Kyou would have made a great couple easily in another lifetime (more so, than Tomoyo in the first "alternate world" OVA, in my personal opinion). Fun note: This final special is also the first time true kissing is featured in Clannad! The creators were masterful in weaving together a show without kissing (for what reason? I cannot tell), and give those fans who have been craving it the whole time with a "heck, why not? "-kind of gift. In the end, though Nagisa Furukawa is destined to intertwine with Tomoya, this OVA gives us an even richer insight into the personalities of some very important "other" main characters and is not to be overlooked. Again, the art of this episode is more of the same regarding Clannad/Clannad: After Story and echos well in "tipping its hat" to a masterpiece of a show that is concluding before our very eyes. We are treated to hearing the nostalgic opening of After Story once more as it leaves us with a warmth of long-lasting memory. Unless you absolutely hate Kyou or Ryou for some specific reason, there is no reason to NOT love this "special" of an episode. As it is a special, it is placed as the final "Episode 25" in most orders of After Story's episode listing. However, I would recommend saving and watching the prequel episode last (if you haven't watched it already, Episode 23), as that gives the viewer a better retrospective echo of "memory" upon departure regarding the main plot and, ultimately, the entire story that is...Clannad.